The Panasonic® Mens' Wet/Dry Arc4 Shaver has a total of four Nanotech cutting blades to ensure maximum coverage, comfort, and superior cutting while reducing shaving time. 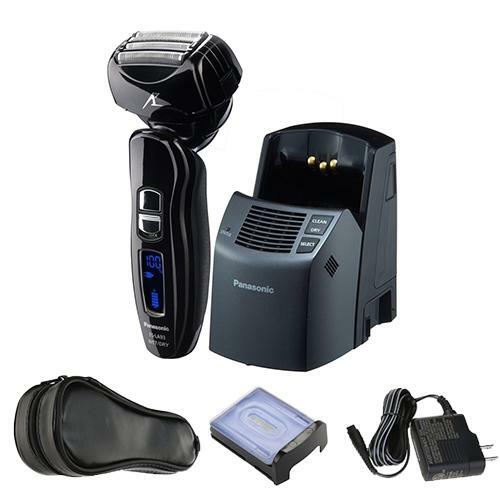 A rapid-fire 14,000 cycles per minute linear motor drive delivers a smoother, cleaner shave, and Panasonic® technology allows your shaver to be fully immersible in water for a great shave in or out of the shower. The Arc4 also has a dock that cleans, dries, and charges the unit automatically. Arc4 Shaving System The Panasonic Arc 4 shaver machine features micro-thin, stainless-steel foils to capture, lift and hold whiskers while four super-sharp, 30-degree-honed Micro-fit Panasonic razor blades cut hair cleanly at the base for a close, precision shave. The result is thorough, high-performance shaving, greater men's electric shaver comfort and reduced shaving time. Both electric razer blades and foils are hypoallergenic and designed to shave gently on even the most sensitive skin. Multi-Flex Pivoting Head The agile, Arc 4 Multi-Flex active head ensures smooth, uniform motion along each of the individual contours of the face to shave the chin, jaw line, neck and head while also providing maximum comfort, making the ES-LA93-K one of the best bald head shavers, too. A built-in precision shaving trimmer gives mustaches and sideburns the perfect finish and detail. Multi-fit Arc Men's Razor Blades The men's electric razor head is gently curved, which lets the shaver glide uniformly over the chin and along the jaw line. With the Arc4 Foil, you can also move the shaver head in a circular motion—ideal for those accustomed to a rotary shaver. 30-Degree Nanotech Blades The ES-LA93 cordless shaver features men's shaver blades that are forged and honed to an acute 30° cutting edge to cut more efficiently and cleanly at the root. Stainless-steel, hypoallergenic Arc 4 blades and foils provide gentle comfort for male grooming. Wet/ Dry Convenience Whether you're in a hurry or have time to spare, the premium wet/dry Arc4 cordless razor is ready when you are. Use this men's wet/dry shaver for a quick, dry shave when pressed for time or when time permits, shave over the sink or in the shower with your favorite shaving foam or gel. Powerful Linear Motor A smoother, cleaner shave is also faster with the quiet, high-performance linear motor designed to shave at speeds of 14,000 cycles per minute (cpm), and ensure peak electric razor performance throughout the shaver’s battery life. Compared with 10,000 cpm shavers, the Arc4 cordless shaver operates nearly 1.5 times faster, with twice the cutting force. Peak Performance Anywhere The powerful Arc4 men's electric shaver system maintains peak performance right up to the end of the battery charge and throughout the life of the Arc 4 men’s razors battery itself to ensure a consistently smooth and satisfying shave. With universal voltage conversion and a travel lock, you can easily take the men’s electric razor with you when travelling internationally. Clean and Charge Station The Arc4 ES-LA93-S men's wet/dry electric razor is 100% washable and rinses clean under running water with sonic vibration cleaning mode. An automatic clean and charge station thoroughly cleans the Arc4 wet dry electric shaver to help keep your shaver in pristine condition. And ready for the next shave.